The Wailing (곡성 | 哭声) is a difficult film to review without revealing much. As the movie opens with a biblical quote from Luke 24:37-39, “See my hands and my feet, that it is I myself. Touch me, and see. For a spirit does not have flesh and bones as you see that I have”, the audience are led into the life of Jong-gu (Kwak Do-won), a village policeman who is nothing like our usual film hero. He’s most probably the co-worker whom you would want to see laid off because of his 101 excuses and unprofessional work ethics. That was what made him real and somewhat comedic. The looks of disgust you see on his boss, wife or even his mother-in-law when he behaved in certain ways (like… nightmares) was awkwardly humorous. And I definitely enjoyed the little light hearted moments between him and his young daughter Hyo-jin (Kim Hwan-hee), who seem to be more matured and understand certain things better than her dad. It had been some time since I’ve watched a film which made me feel as if I was reading an exciting mystery book. While the film was slightly bloody and gross (great makeup effects on the infected victims), I had this odd sense that the story was heading towards something that I won’t like. It felt like a dream where I could feel that it was becoming a nightmare, yet there were so many little black comedy elements that kept me from trying to get out of the “dream”. It was difficult to un-watch and imagine someone else taking up the role of the mysterious Japanese stranger once you’ve finish watching this film. Jun Kunimura has eyes and expression which seems to be hiding countless secrets and stories. He didn’t have much lines in the film, yet his presence spread throughout the 156 minutes. The Wailing was an unpredictable movie twists that might get you saying, “I knew it” and the next moment doubting what you knew. Not only did it keep me constantly on the edge, breathless with the chases, dizzy and nauseous with the rituals, horrified by the hair-standing blisters and boils, the director successfully made me want to watch this film again, this time to uncover the clues which I’ve missed. The Wailing scripting took 20 months to complete, 6 months of filming and 1 year of post production work. 97 days of the film’s total 121 shooting days, or 80% were shot on location in various cities and towns around Korea including Hamyang, Cheolwon, Gokseong, Gurye, Suncheon, Jangseong, Haenam, Hwasun, Gochang, Jinan, etc. Extensive scouting was done and locations were selected by judging the shape of houses to the form and curvature of trees. Jong-gu’s house, which serves as the main stage of the film, was found at the end of an exhaustive search of traditional Korean homes across the country in order to find the exact layout and gate appropriate for the story. Scenes shot in the mountains with no road access, such as the 336m high cliffs at Seonunsan Mountain or the waterfall, required the crew to haul heavy production equipment, cameras and cranes along narrow mountain paths back and forth for several days. To impart the greatest degree of naturalism to the art direction and props, the crew prepared as many real objects as possible and limited their dependence on CGI and post-production work. The shamanic ritual performed by Il-gwang was staged by combining objects and forms used in various actual rituals. It was shot in a 15-minute long take using 6 different cameras, he created a highly original look. The music used in the sequence is played by actual shamans, and all the actions played are the same as in the ritual of exorcism performed in real life. To impart an utter reality to the high quality visuals in THE WAILING, the team had to wait for the appropriate time and weather for the situations in the film. Director Na Hong Jin was committed to finding the appropriate tone and atmosphere for the mysterious events that take place in the story. He waited for actual clouds and rain in order for the sky to be in the perfect condition for each scene. The chase scene featuring Jong-gu’s companions on the mountain road was all shot with actual heavy rain, such that shooting of the scene started in the fall and only finished in winter. Besides the weather, the time of day was a factor that was beyond compromise. To take advantage of the special natural lighting at Magic Hour, the crew scheduled shooting during a brief window of time at dawn, sometimes shooting only a cut or two each day and taking several days to finish a particular scene. The withered snapdragon flowers that form the shape of skulls were prepared by drying real flowers for several months before the shoot and choosing those that most closely resembled skulls. Multiple award-winning Director of Photography Hong Gyung Pyo who is renowned for his refined but dynamic camera work in films like SNOWPIERCER, HAEMOO and MOTHER collaborated with Na Hong Jin for the first time. He made selective use of an anamorphic lens in order to create changes in the depiction of certain spaces. The director was inspired to write this story due to the several deaths of his close acquaintances followed one another. Their deaths were not of natural causes, and all throughout those days of the funerals, the director pondered about their deaths. The question was, “Why did THEY have to be victims OF ALL PEOPLE”? He began to meet and talk to the clergy of various religions, which was the starting point of this film. The appearance of the biblical quotes and shaman rituals symbolizes the flexibility and the director’s identity both as Asian and Christian. Read to know more about the director and his team in the Playlist interview. 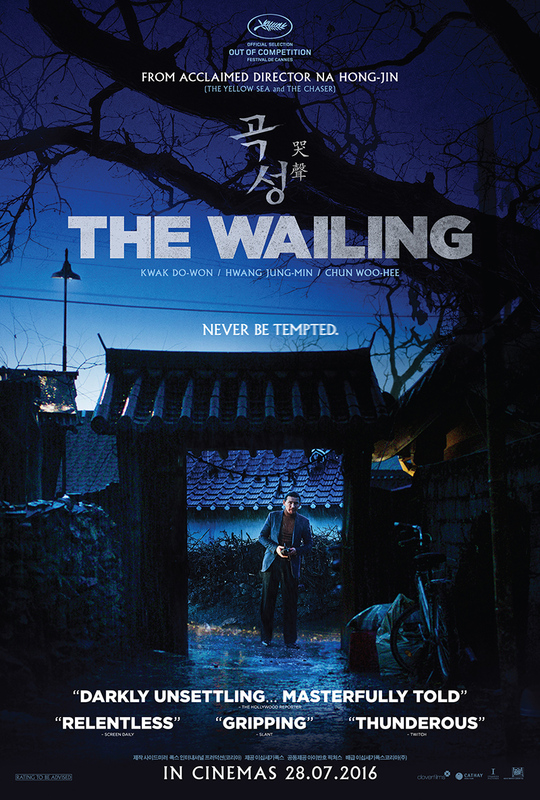 Check out The Wailing (곡성 | 哭声) Official Website and Facebook Page! The Wailing (곡성 | 哭声) is out in cinemas on 28th July 2016. *Disclosure: Invitation and Images with courtesy from Clover Films Singapore. No monetary compensation was received for the movie review. This sounds super creepy! I love suspense Asian films and this one sounds pretty promising. I love Korean movies but never into this kind of genre yet. Hoping this will be out in my country soon. If you want to watch again, to see what you missed the first time, then I agree it’s been well done. The review was riveting. I love to read behind the scenes section of your reviews. Such a hard work these actors put and of course there is politics involved as well. The posters reveals an intimidating appeal, I’d love to relate with this movie. It’s cool to see Korean movies coming out strong with such thrilling, action movie. That’s a lot of work! It’s been a while since I watched a film like this and it would be nice to give this one a try. I think it’s a good move that they chose a lead that is not “perfect” but relatable. I was definitely intrigued about how you described this film so temptingly. It sounds so good, and this genre of thriller is a favorite of mine. Problem is, when will it come to my country, if ever. I would love to watch this one because of the mystery and the surprises. I hope they have one with english subtitles.